Drawing on stakeholder input and state-of-the-art modeling, we will create a Hazards Stress Test Tool, a web-based tool that allows planners and decisions makers to measure community stress and to assess the vulnerability of their communities to a variety of hazards and disaster scenarios. The tool will allow them to explore policy choices related to disaster risk management and mitigation to reduce “stress” and increase resilience under a variety of assumptions about longterm trends in coastal hazards. We will develop a web-based Hazards Stress Test Tool (HSTT) that supports coordinated actions in all risk management and mitigation phases involving collaboration between federal, state, local, tribal, and private sector partners. It addresses the nexus of risk assessments, land use and hazard mitigation plans under climate change. 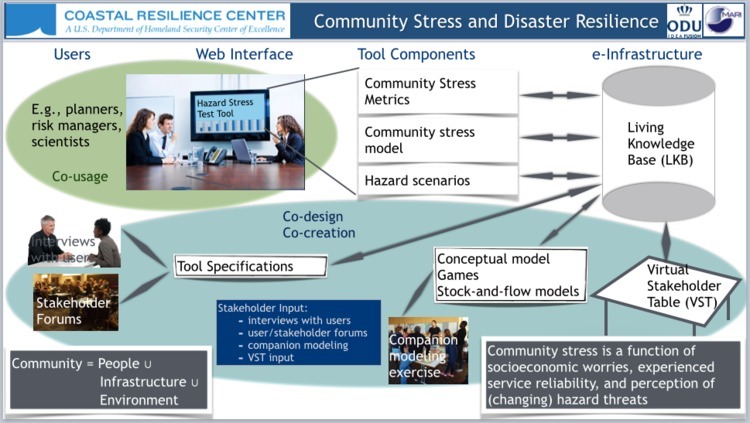 “Community stress” (CS) preconditions the capability “to prevent, protect against, mitigate, respond to, and recover from the threats and hazards that pose the greatest risk.” CS is a proxy for this capability. CS has not been systematically integrated in disaster risk assessments. Significant knowledge gaps in the probability density functions (PDF) of local sea level (LSL) rise and extreme events make rigorous assessment of costs and benefits impossible, leading planners to make decisions based on somewhat arbitrary assumptions. Interdependencies among services, infrastructure, buildings, environment, and social fabric are not always considered. The processes in the coupled naturalhuman system that translate hazards into disasters are not yet fully understood. The HSTT will support the identification of factors that determine CS and aims to increase foresight in how a changing hazard spectrum could impact CS. The HSTT will include a Living Knowledge Base (LKB) and Virtual Stakeholder Table (VST) and allow decision makers to explore policy choices to reduce CS and increase resilience under scenarios for long-term trends in coastal hazards. For many systems, pre-stress conditions the response to perturbations. Our approach builds on, for examples, lessons from “bank stress” tests of financial institutions' resilience and the utilization of CS for considerations of environmental health risk. Existing socio-economic and environmental indicators will be used to design metrics for CS. A probabilistic approach to hazards is under development. Vulnerabilities of services are being studied by network analysis. Complex system theory informs vulnerabilities arising from couplings. Integrating CS into risk assessments using dynamic modeling techniques goes beyond current approaches and addresses a policy-resistant problem that is structural, behavioral, and social in nature. The transition to probabilistic risk assessment for sea level and climate-related hazards has been proposed but not yet achieved. Recognizing and incorporating vulnerable populations in the modeling efforts will ensure that their needs are considered. The proposed LKB-VST combination is a novel way to facilitate the co-design of the research agenda and the co-creation and co-usage of practice-relevant knowledge. Hampton Roads, with its high flood risk will be used as a testbed and validation region, while ensuring that the HSTT easily can be extended to other regions with high risk or vulnerability to various stresses.